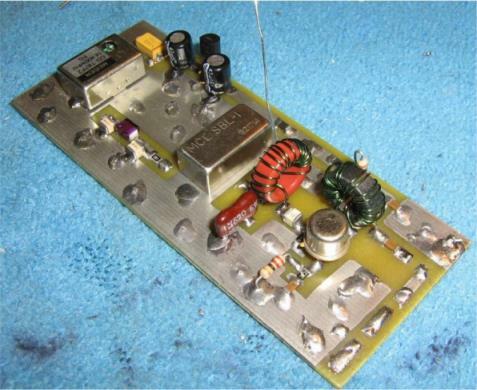 The 28.8 MHz crystal oscillator on the RTL-SDR is known for being low quality. A low quality crystal means that the frequency tuning can be off by a few KHz and can cause the tuned frequency to drift over time. In this article of the GBPPR ‘Zine (kindly mirrored by superkuh), the authors show a tutorial on how a cheap high quality 14.4 MHz temperature compensated crystal oscillator can be combined with a frequency doubler circuit to create a high quality 28.8 MHz clock source, which can then be used to replace the low quality oscillator on the RTL-SDR. A 14.4 MHz oscillator is used as high quality 28.8 MHz oscillators appear to be rare. Hello,please pcb printed on this article of the GBPPR ‘Zine 28.8 MHz oscillators ?